Recently I was contacted by Okabashi to review a pair of their flip flops...... it was music to my ears. Living in the south my shoe of choice is the flip flop since they can be worn almost all year. The problem with wearing flip flops so much is that if I do n ot find ones with good support, my feet and back let me know by hurting! 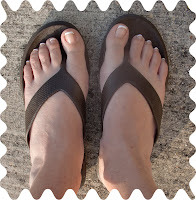 When my pair of brown Maui flip flops arrived I was ready to put them to the test (glad I had a pedicure lol). The first thought when I put them on was comfy! But the true test would be wearing them for the day. 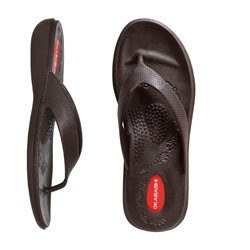 The Maui Flip Flop has massage beads that focuses on the arch and midfoot. After a full day running errands and shopping at the mall my feet or back did not hurt !!!!! The support was great!! I think the biggest surprise off all was the price of this pair is only $19.99, I hate to admit that the last pair of flip flops I purchased with theses features cost me almost $50. One of the great features of theses shoes are they are so easy to clean. They can be hosed off for a quick cleaning and they are anti-microbial and machine washable. Okabashis clean very nicely in the dishwasher ( yes I said dishwasher), Okabashi recommends the dishwasher because it does a better job sanitizing. Just use a normal cycle, as the hi-temp settings could be a little too hot. Your well-loved and worn Okabashis can always be recycled; often into new shoes, sandals or flip-flops. The average pair of Okabashi sandals made this year is expected to have about 25% recycled material. Darker colors typically have more recycled material than lighter colors like white and yellow. Recent tests confirmed that Okabashis can contain up to 85% recycled material with no change in durability. Okabashi sandals and flip-flops have been designed and made in the USA for more than 25 years - Buford, GA to be exact. The average Okabashi shoe or sandal travels only 700 miles, whereas the average shoe sold in the USA makes a journey of over 11,000 miles before it is ever worn. Not only is it good for the U.S. economy to make shoes in the USA, it's also good for the environment. Visit Okabashi.com and check out their large selection of footwear! You will be amazed with the selection, color choices and most of all affordability. Okabashi sandals and flip flops have a 2 year warranty against defects! Oh I love flip flops! I like the design of these and the fact that they can be cleaned is awesome! Wow, I love these! Here in So Cal we wear flip flops virtually year round, too, and it helps tremendously to find some that are nice looking and good for your feet. I have washed flip flops in the washing machine with a load of towels but never in the dishwasher - brilliant idea, I'll do it! Huge flip flop lover! Great review and they look super cute. Nice pedi too! come visit if you want. Hey, K Swiss, please figure out wtf you want to say prior to engaging your fingers. Did you major in Ebonics?? They're flip FLOPS, not flip FLAPS. The rest of what you verbally vomited makes 100% of zero sense. Make sure that you have Mommy's permission next time prior to using the computer. Otherwise, you might have your milk money revoked.